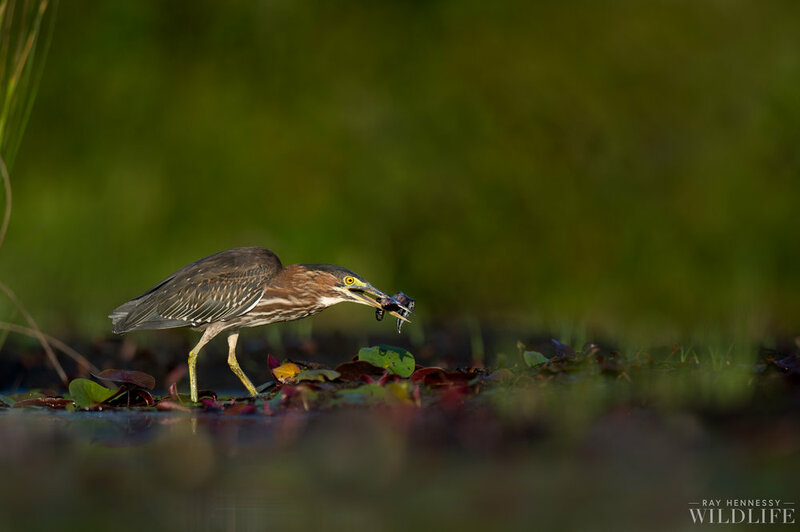 This was one of many Green Herons that were hunting in the shallows of this small pond. I was in my floating blind for this shot so when I saw the heron actively hunting I had slowly moved my way closer and into position for a clean background. I was thrilled when it pulled a tadpole out of the water right in front of me so I was able to capture that moment. I always love shooting at this location due to the wonderful habitat of lilly pads, great light and no other people. It's a lot of work to get in the water with these birds and kinda gross too (the mud is well past knee deep sometimes) but it's worth it to get these close and intimate views of Green Herons and other shorebirds that have no idea I am there with them.